Currently, there’s no limit to the amount of wine you can bring back to the UK from France and the EU, provided it’s for your own use and you travel with the goods. That way you save £2.50 a bottle in UK duty (of £2.08 plus VAT on the duty). 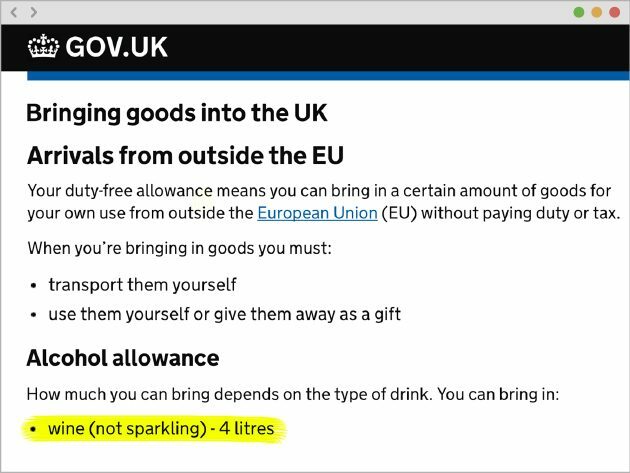 If you bought the wine outside the EU, however, the limit is 4 litres, plus a whopping 2 litres of sparkling wine. If Britain leaves the EU, we’re struggling to see what incentive there is for the taxman to increase the non-EU allowance. The Channel Islands, for example, are not treated as part of the EU for customs purposes today and non-EU limits apply already (see below). 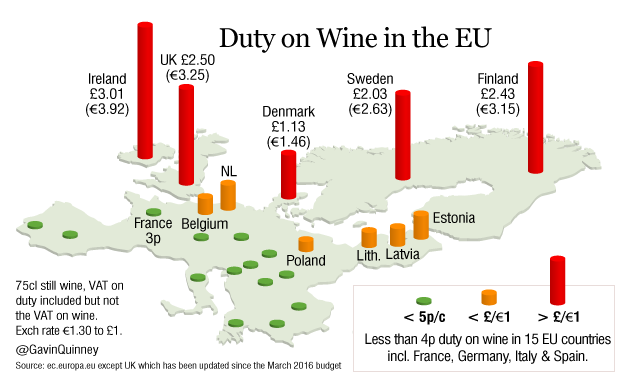 Each country in the EU is free to impose its own rate of Excise Duty and Britain has one of the highest rates on wine. Here are the relevant pages from the Gov.uk website. You can bring some goods from abroad without having to pay UK tax or ‘duty’ (customs charges), as long as they’re for your own use. You must tell customs about (‘declare’) any other goods when you arrive at the UK border, as well as anything that’s banned or restricted in the UK. If you owe any duty or tax, you’ll usually have to pay it immediately. Your goods and any vehicle you use to transport them may be seized if you break the rules. You may also be fined or prosecuted. You can report someone for breaking the rules to HM Revenue and Customs (HMRC). The Canary Islands, the north of Cyprus, Gibraltar and the Channel Islands are not part of the EU for customs purposes – follow the rules for countries outside the EU instead. Although there are no limits to the alcohol and tobacco you can bring in from EU countries, you’re more likely to be asked questions if you have more than the amounts below. Your duty-free allowance means you can bring in a certain amount of goods for your own use from outside the European Union (EU) without paying duty or tax. You can’t combine allowances with other people to bring in more than your individual allowance. Declare any goods over your allowance. Your goods could be seized if you don’t declare them. You may have to pay Excise Duty on alcohol you declare.